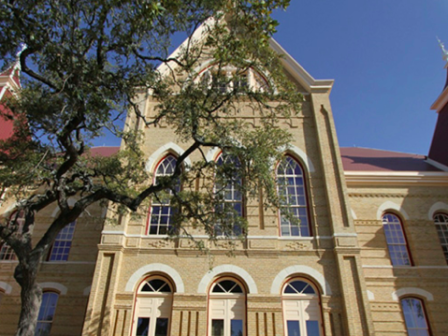 When Southwest Texas State Normal College in San Marcos, Texas opened its doors in 1903, Old Main was the only building on campus. Now called Texas State University with student enrollment topping 35,000, the historic Old Main building remains the most memorable edifice on campus. In 1983 Old Main was added to the National Register of Historic Places. The exterior had become so badly blemished that extensive historically sensitive restoration was needed. Roof projects included complete replacement of the existing metal shingle roofing which was a mix of flat and micro-corrugated shingles, new roofing underlayment and decking repairs. The existing, historic metal finials and the decorative metal cornice and gable insets located on each of the four towers and at the south gable were all carefully repaired and refinished. The metal coping at the tower gables and all metal gutters and downspouts were replaced as new to match the same profile as the historic gutter. While earlier photographs did not provide enough detail as to determine the type of shingle, multiple fragments of a “fish scale” stamped shingle were found in the attic which suggested that these were the type originally installed. During demolition of the existing metal shingles, the same “fish scale” shingles were discovered in several valleys of the building confirming this assumption. All of the window sashes and the wood brick moulds were replaced in the 1980’s with an inferior quality wood resulting in significant deterioration. The scope of this project was to replace all the window sashes (excluding the basement windows) and brick mould surround. The new sashes were constructed of reclaimed, old-growth, longleaf pine and were based on profiles from interior elements on the building that had been determined to be original to the building and glazed with a high performance laminated glass to provide additional thermal comfort to the occupants. The existing wood window frames were engaged in the masonry wall, and therefore did not appear to have been replaced with the windows previously. The existing wood frames were repaired in place to eliminate issues such as wood rot and air and water infiltration. Additionally, the main entry doors at the east and west ends as well as the south doors were replaced. The south doors were recreated as closely as possible to the historic profile while the east and west entry doors, although similar in style and proportion to the historic profile, needed to comply with current egress and accessibility codes. Other major projects included the 100% cleaning and replacement of the existing damaged and non-historic brick and limestone, as well as the complete repointing of all masonry, and all decorative stamps were restored to match the original pattern. Additionally, a lightning system was added to the building which minimized the impact of the lightning protection on the historic appearance of the building, running the majority of downleads in the attic or in other concealed spaces.